URBANA, Ill. – Pests and pathogens are keeping Illinois corn and soybean farmers busy right now, with recent reports of Japanese beetles, grey leaf spot, Diplodia leaf streak, and southern rust in fields across the state. “This week has seen a slight uptick in the number of foliar disease reports in corn, likely as many people are actively scouting prior to making a fungicide application decision,” says Nathan Kleczewski, field crops pathologist in the Department of Crop Sciences at the University of Illinois. Grey leaf spot is present to varying degrees in most corn fields at the moment. While grey leaf spot may be no big surprise to most Illinois corn growers, Kleczewski notes that farmers should be on the lookout for Diplodia leaf streak and southern rust. “Diplodia leaf streak can easily be misdiagnosed as grey leaf spot, northern corn leaf blight, or other foliar diseases and disorders. Characteristic foliar symptoms include oblong, irregular, or blocky lesions with green/yellow edges. Often ‘targets’ can be seen in the lesions, where the initial infections occurred. Older lesions contain black pycnidia, which resemble tiny pinheads or dots. You will not see these in grey leaf spot or northern corn leaf blight lesions,” he says. Southern rust rolls up towards Illinois every season from the southeast. So far, it has only been confirmed in low frequencies in two Illinois counties – Bond and Franklin – but Kleczewski recommends farmers keep an eye on the southern rust iPiPe map for daily updates, citing the devastating effects of southern rust on the Illinois corn crop in 2016 for motivation. “Although southern rust currently is not considered to be a significant threat to the corn crop in Illinois, it is important to continue to scout, as changes in the environment could cause the situation to change,” he says. Meanwhile, both corn and soybean growers are assessing damage from Japanese beetles. “It is proving to be a big year for Japanese beetles in Illinois, and while populations should be starting to decline in much of the state, there is still a lot of feeding going on,” says Nick Seiter, a field crops entomologist also in the crop sciences department at U of I.
Japanese beetle damage can be eye-catching, especially on the edges of fields, but Seiter notes that growers should consider the economic threshold of insect damage before settling on an insecticide program. 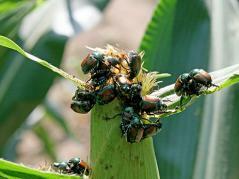 For corn, the economic threshold for damage is three or more beetles per ear with silks clipped to half an inch or less while pollen shed is less than 50 percent complete. “Silk-clipping by Japanese beetle feeding can impact pollination; however, this damage often appears worse than it is. In many cases, silk-clipping is observed on ears that have already been pollinated, and if an insecticide is put out at that point, it will only be good for revenge,” Seiter says. For soybeans, the economic threshold sits at 30 percent defoliation before bloom, and 20 percent after bloom if the target insect is still present in the field and actively feeding. Seiter says defoliation is easy to overestimate, and recommends training scouts for more accurate estimates. Seiter notes that initial control can be achieved using a pyrethroid or carbamate insecticide, but he cautions that the residual activity of the chemicals is short-lived. Both Seiter and Kleczewski plan to speak during U of I’s 2018 Agronomy Day program. This year’s event will be held at 4202 South 1st Street in Savoy on Aug. 16, starting at 7 a.m.
For more information about diseases currently affecting corn, read Kleczewski’s complete article on the Bulletin. And for more help determining the economic threshold for Japanese beetle damage in corn and soybean, read Seiter’s recent Bulletin article.